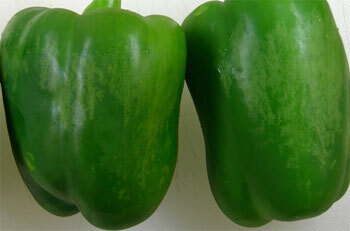 Have you seen the silvery white discoloration usually found on red or green peppers? Do you think it should be scored as a defect? Or is the discoloration only slight and not really an issue? The USDA scores the defect if the area affected is greater than 10% of the surface. Too easy? Too hard? Let me hear your thoughts. If anyone has a better picture of the silvery white discoloration please e-mail it to me (info@ipt.us.com) and I will post it for everyone to see. On the red peppers it really stands out. Maybe there should be two scoring guidelines…..more than 10% surface area for green peppers, and more than 1 inch diameter for red peppers. We are all over the board with this defect. Some inspectors score this on sight, while others competely ignore it. I don’t think it should be a defect unless the area affected is really discolored and more than 33% of the surface. And this same defect shows up on green onions. Inspectors are all over the place on scoring that defect too.